We're officially back into the swing of things! But also Mage Irka if you're reading this I'm so sorry. 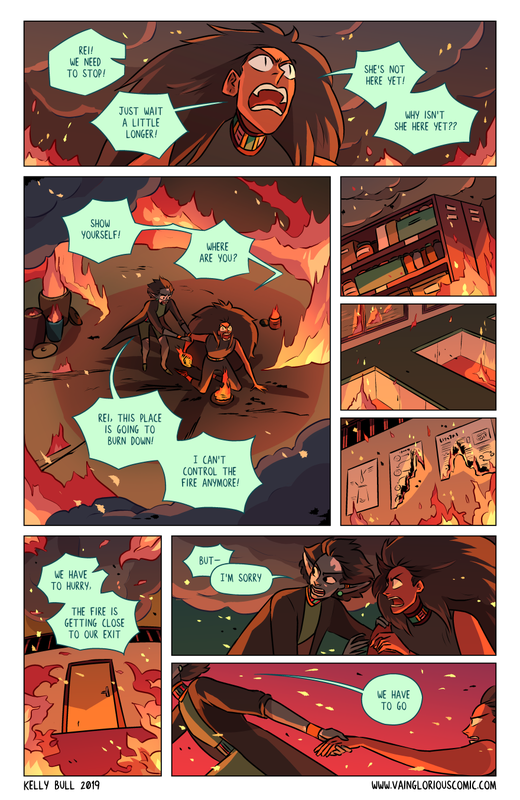 Also I can't remember if I've posted this here before, but have an illustration where Rei and Von are fine and there is absolutely no fire going on anywhere. This is a preview from March's Patreon and Ko-fi wallpaper. I've been uploading older wallpapers separately onto Gumroad along with a wallpaper bundle at a discounted price - so if you just want the wallpapers, and aren't interested in joining up for Patreon or Ko-fi's extra bonuses, you can just head over to Gumroad to buy a few neat Vainglorious illustrations! That's all for today - Thank you for waiting for this chapter, and for reading and commenting! I'll see you on Monday!